It would be nice to skip booting a computer to add content to your website, right? Or how about adding a video with your smartphone while waiting for a meeting to start? It's all in how you build the site. I'm a teacher with young kids at home, so my time is limited. One way I save time is by finding ways to manage online content with my phone. Every one of the following examples of rich content can be updated with a smart mobile device. Communication is key. 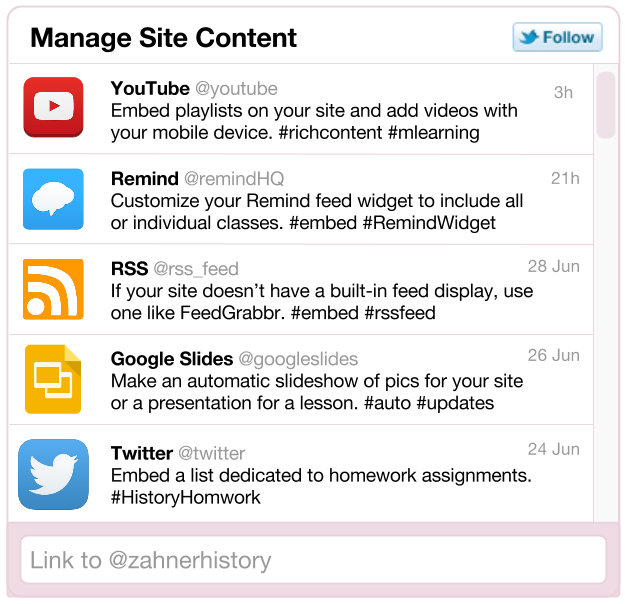 That's why I embed a widget with Remind messages on the home page of my class content sites. The widgets can be found on the list in the upper right under your username. These widgets can be found in settings. You can make a variety of widgets to embed into your site. The one below is a current events list for my students. We use Twitter for current events because it's the most up to date source for news (or almost any information). Plus, it can be easily customized. Making a playlist in YouTube is a piece of cake with the mobile app. Touch the plus sign (+) in the upper right and select or create a playlist. Copy the playlist embed code on the full version of YouTube (see GIF below), and paste it in your html editor. If you haven't thought about searching Pinterest for teaching resources, you're missing out on more handpicked materials than you'll ever need. The benefit of Pinterest over searching Google is the value people with similar interests have already placed on resources. 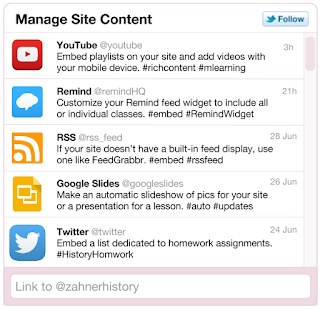 The widget is great because your students don't need an account to access the materials. Follow Kevin's board Instructional Strategies and Technology on Pinterest. It's short work to manage several calendars from your smartphone or tablet. Use it to schedule due dates and assignments without booting your computer. Certain apps or devices allow you to add URLs and attachments, but those options are not consistent across platforms. Year after year, teachers refine their slide presentations with better content and instruction. Embed a Google slide presentation on your site and it will reflect the updates as you make them in Slides, which can be made with the mobile app. I used to have a blog for assignments. 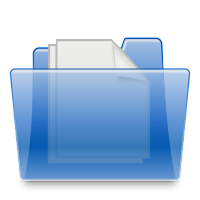 It was the easiest way to provide up-to-date information with attachments, links, videos, slides, and detailed explanations. If we didn't start using Google classroom, we would still use the blog. Students liked that they could access it with their smart devices. This is one of the quickest ways to share content. I usually link an image of a folder to the Drive folder. Just add files to the folder with the Drive app, and your website will reflect the update. You can embed a single deck on your website if you would prefer users to stay on your site. Otherwise, sharing a link to a folder of decks is a lot less work and can be updated with the mobile app.